The University of California Davis’ Unitrans service, launched in 1968, provides service to more than 3.6 million riders each year using iconic double-decker buses, modern buses and all student drivers. In its original form, the service operated only two vintage London double-decker buses — now it has 49 vehicles and is moving toward an entirely CNG-powered fleet. Unitrans has 245 student employee positions and 15 full-time positions, according to GM Anthony Palmere. The service’s main challenge, he said, is the training required to keep a fully operating staff, since a large crop of employees is graduated each year. The trainees receive training in both parking lots and simulated courses from their peers who have already completed training and received their licenses. Those students “ride along with [the trainees] to train them in dealing with passengers and all the different procedures necessary to providing the service,” Palmere says. Unitrans, which is primarily funded by student fees, serves the campus and its surrounding areas, as well as city residents. All of Davis’ secondary schools, major shopping centers, libraries and medical facilities are served by Unitrans routes. However, 90% of riders are students, according to Palmere. Since the student fee provides approximately $2.3 million of the service’s $4.5 million annual budget, students with a valid ID ride for free. Other riders can ride for one dollar cash fare, or purchase prepaid discounted tickets and passes. The rest of the budget is covered by Federal Transit Administration funds and a California sales tax. 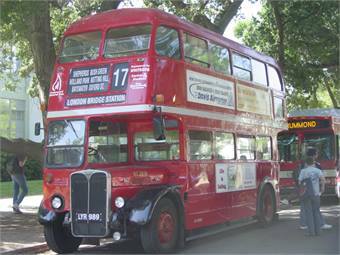 Unitrans’ vintage double decker bus was converted to CNG, and is the only of its kind in North America. 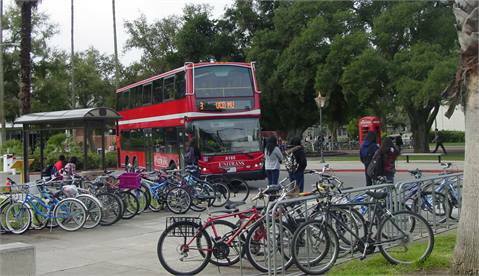 Efficiency is important to the university, which has been recognized for its sustainability efforts, as well as its “cycling culture” — about 50% of students ride a bike to class. Another 25% use Unitrans and about 6% walk. “About 80% of the students are coming by some alternative mode other than driving. That's something we're very proud of,” Palmere explained. In that vein, Unitrans is moving toward more sustainable fueling for its vehicles. Most of the service is provided by modern CNG-fueled buses, and the university’s CNG-powered double decker bus is the only of its kind in North America — perhaps in the world. The Unitrans service also connects to other services in the region, including the Yolo County Transportation District’s YoloBus, which takes passengers around Yolo County, Woodland and Sacramento. Palmere said Unitrans makes UC Davis and the surrounding communities completely accessible to students who don’t have, or don’t want to use, a car.